Another league campaign over. Another relegation confirmed. Division one in 2009 to division three in 2011. The Irish housing market hasn’t slid as quickly or as far as the fortunes of our county footballers. It is now 14 league outings in a row without a win. Kilkenny are the only other team in the entire league not to have collected any points. A dismal points difference of -52 to boot. Tipperary, who were also relegated, at least finished with five points to their name and a scoring difference of -10. They also managed to beat us by six points last Sunday in a game that counted for little other than pride. We had little difficulty in accounting for them when we met them in the qualifiers in Tipperary two or three years ago. That further emphasises how far we have fallen. Just as it’s hard now to believe there ever was a Celtic Tiger and full employment, it is also hard for to believe that just two short years ago we beat Dublin in division two league final and played division one football last year. It is division three for next year at least and perhaps longer if we are not careful. So it would be folly not to be asking why our fortunes have slid so badly. Is there a straightforward explanation? Are there lessons to be learned going forward? After a decade or more of relative success, questions are now being asked both with in the county and indeed throughout the country as to why as a county we have lost our competitiveness. Morale amongst supporters and more importantly, amongst players, must be at an all time low. And remember we are just seven weeks away from championship. Considering there are two rounds of club championship in the meantime, the reality is that that leaves just five weeks to turn things around and very little will be done in the week leading up to the game. Wicklow or Carlow will certainly not be quaking in their boots when they take the field against us on June 6. Indeed if things don’t change drastically in the next few weeks it will be hard to have any confidence going into our opening game. 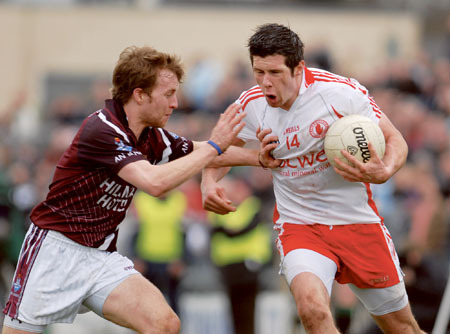 There is no doubt that Westmeath are in transition. The majority of the 2004 team are now at or near the end of their careers. Our failure at underage level over the past decade is now coming home to roost. Since 2000 we have failed to win a minor or U21 title or indeed to come close. Thankfully our U21 side this year showed there is hope for the future, even if they lost a vital game they should have won. Yet I don’t believe football in Westmeath is as bad as recent results would suggest. While Westmeath were always going to struggle somewhat this year, I think the county board must take some of the blame. The decision to appoint Brendan Hackett seemed strange at the time, given his lack of GAA management experience. It is inevitable that fingers will now be pointed in his direction. So is it right to make him the fall guy? While I would never doubt his good intentions and I’m sure he sold himself well in the interview, I have no doubt that if someone with a stronger football pedigree were appointed, a number of players who decided to retire would have made themselves available. The idea of having someone more associated with athletics managing the senior county team didn’t appeal to a number of the more senior panel members. Once he was appointed however, he along with the rest of his management team deserved to be given time to prove themselves. It might seem a tad unfair to be judging him four or five months into a three year plan but I think it is a good time to take stock. Brendan constantly talks about building a team for the future. What about the present? Any member of any panel is principally concerned with how they will achieve that year. Talk of building a team for three years time would do little to encourage any lad near the 30 mark to make himself available. Supporters too demand that their best team, or close to it at least, is available so that they can get value for their money. It is clear that the team are not playing with any confidence. I know that this happens with a bad string of results but it is up to the manager to turn that around on the training field and in the dressing room. So far this hasn’t happened. Indeed some of Hackett’s post match comments would do little to bolster confidence. He has openly criticized midfield, where admittedly we struggled at times in the league and after our latest defeat said he will be seeking out challenges against division three teams. Certainly not being over-ambitious. Playing players out of position during the league did not help either. While Martin Kennedy is doing most of the physical training, and doing a good job, it is hard to see the sense in spending time at this stage of the year travelling to Dublin to train in a boxing club. That is what Westmeath have done for the past two Friday nights and there is talk of doing it twice more. Kilbeggan racetrack has also been mentioned as a venue for upcoming trainin sessionss. I have done my fair share of laps around the racetrack in the past, but not five or six weeks before championship when football is what every player needs and wants. From what I see and hear, Brendan Hackett has alot to offer but not as manager. His CV and his talk would lend itself more to the role of Development Officer than to the brief of inter-county manager. Yes he did take our U21s to a Leinster final but with the talent that was at his disposal that was not as big a feat as it might seem and the reality is that it was a missed opportunity in the end. Like every other football supporter in the county I wish him and his team well in the coming weeks as they attempt to turn things around. At this stage all that matters is June 6.